Noone can "give away" their insights, since they literally are "sights from within". However, sometimes the shared stories and insights of others can be a part of our own unique path to the personal insights that awaken within ourselves. Below is the story of my procrastination. If you'd like to skip the story and go right to the insights, just scroll down to Insight #1. 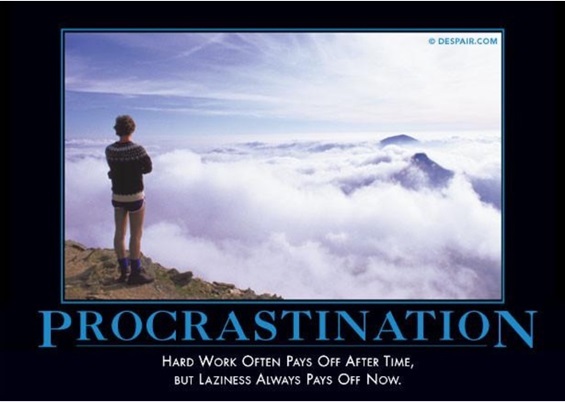 I have felt that I've been a "procrastinator" all my life. I think the belief started when I was around 7 or 8 years old, being told by a very angry adult voice that said, "You never finish anything!". When I heard that, I could have possibly disagreed by thinking about all the many things that I had actually finished... but I didn't. I could have possibly thought that the person who said it to me was simply wrong, or that they were just grumpy and mean and not talking sense... but I didn't. I could have possibly simply forgotten what they said... but I didn't. I could have had an infinite number of other perspectives for their statement... but I didn't. Instead, I believed them. It stuck in my head as something that was true. I remember feeling inadequate, and embarrassed, and ashamed, and "not OK", and not really knowing what to do about it. I realized I had quit things and not finished things and not done things when I "should" have done them, so it must be true, and if I wasn't sure before, I now knew it was not OK.
At about the same time, another adult in my life began reinforcing the same thing. I started taking piano lessons at age 8, and my teacher was verbally abusive. If I hadn't practiced, or only practiced a little, she would scream at me, ask me what was the matter with me, and likely spewed many unkind words, often having me in tears. I remember very little of what she said, but I do remember my stomach tying up in knots before walking to her house before each weekly lesson, and I do remember crying on the way home, clearing my tears before I walked in the door so my mother wouldn't see. Still feeling ashamed and inadequate for my behaviours, I didn't want my mother to get angry at me too. What's the matter with me? Why don't I practice? Of course, I did do some practice, but since in my mind it was never "enough", or at least wasn't the amount that I understood that I "should" be doing, it didn't count. I continued those lessons for 10 years. At some point, the crying stopped, and the yelling by my teacher stopped, but my belief in my inadequacies and weaknesses never did. And so, with that belief being carried around in my head wherever I went and whatever I did, my journey in life was then frequently defined by noticing and making great significance out of anything that I thought I should be doing that I wasn't, and by completely dismissing anything else that I was actually doing and finishing. For some reason, all the stuff done and finished didn't count. And whether it was because of the happenstance of my personal nature, or because of my belief in my procrastination, or because of my magnificent collection of other acquired beliefs... all of it informed my behaviours and my life. It affected my views and behaviours for arriving on time or not, for keeping my room or my house clean or not, and for completing the items on my never-ending list of to-dos or not. I wasn't always arriving late, I wasn't always leaving things messy, I wasn't always "mis-managing" the items on my to-do lists, but every time it appeared as if I did, I saw it as significant, and shameful, and something that was not OK, without any understanding of why I was this way, and why I wasn't able to change it. Thank goodness all of my belief in my brokenness wasn't on my mind 24/7. Fortunately, the human mind has an automatic clearing system. As soon as I would get my thoughts off of myself, being busy at school or work, or involved in some activity, or hanging out with friends, I would forget all about my brokenness (including my beliefs in procrastination), and I would do stuff and get stuff done. AND, I laughed a lot. For some reason, a lot of funny thoughts would pop into my head that made me laugh... and they'd give me all sorts of great ideas for amusing and fun stuff to do and say. I revelled in getting to "play" and be creative, never for a moment noticing the significance of the fact that my "brokenness" didn't exist when my mind wasn't on it. One of the benefits of humour is that you can often use it to make fun of the truth. And so, probably as a way to cope with my brokenness, I would often make light of some of my perceived weaknesses, including my perceived procrastination. 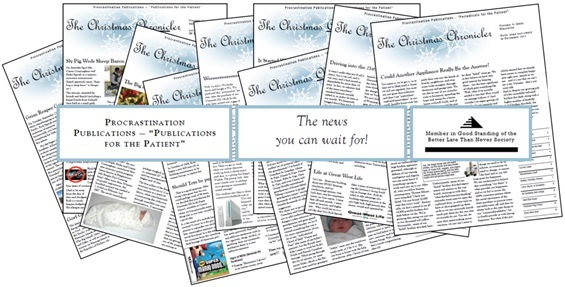 With a habit of rarely getting holiday and birthday cards into the mailbox with enough time to arrive before the date, and starting a yearly Christmas newsletter for family and friends, I decided to put it together with an official newsletter format, created by "Procrastination Publications"... "Publications for the Patient"... "The News You Can Wait For"... "Member in Good Standing of the Better Late Than Never Society". When I eventually came across the Three Principles, realizing the complete illusion of all thinking, I then had the desire to share my experience and insights with family and friends. And so as a complement to the 2013 newsletter, the www.procrastinationpublications.com website was born, with my story shared on the home page, just as it is now. Seeing the illusion of all thought was my first significant insight that immediately released a heavily loaded lifetime of insecure thinking, including many of my thoughts about procrastination. However, for anyone that has experienced an insight into the Principles, you may have discovered that it is not an immediate panacea for all your suffering... at least not in the way that you probably expected. And so to this day, my head still fills with many of the ways and means in which I am a procrastinator... and my head still completely ignores most of everything I get done... but fortunately I've caught on to the tricks that it plays, and I suffer a great deal less for seeing past it. Over the last few years since coming across the Principles, I haven't completely "cured" many of my beliefs in procrastination or perceived behaviours of procrastination, but I have had a number of helpful insights along the way. And so this page is dedicated to sharing what has occurred to me so far, and I'll make sure to add any new insights, if they happen to arise. If you've had any of your own insights into procrastination, I'd love to hear. I made up all sorts of stories that if I don’t do specific things at specific times, then doing it any time later is in some way wrong. I made up deadlines and concepts in my head about when and how things should be done, and anything that didn’t meet those deadlines or specifications was an additional tally on my lifelong list, counting the number of times that I procrastinated. I made up stories about how long it should take to get things done, and believed that anything that happened to take longer was a clear indication and result of my procrastination issue, and a reflection of my inherent weaknesses and flawed behaviours. In contrast, other people will create their own reasons or justifications for not getting things done, such as too busy, too difficult, not a priority, not on my radar, forgot to do it, not a big deal, will get it done eventually, don’t particularly like doing it so tend to avoid it, etc. AND, they will give each of those reasons very little conscious thought or significance. They think it and let it go, or they don’t even think about it at all. They don’t create a huge story about themselves, about being bad for not getting all sorts of things done when they should be done, or being bad for not doing something at all. They end up seeing most incidents of delay or non-doing, simply as a change of mind, or a change of circumstances, or other people's fault, or a consequence of life, and not as solid proof of the terrible personality defect of procrastination. Insight #2: I Thought About it a Lot! The truth is that EVERYONE delays doing all sorts of things, and everyone believes that they have things that they typically procrastinate on, and for many it’s a bit of a problem for them, but they just don’t happen to spend a lot of time thinking about. However, for some, like me, procrastination just happens to have been something that I incessantly focused on and gave significance and meaning to... constantly thinking of my never-ending list of shoulds and to-dos, thinking about what I wasn’t doing, why I wasn’t doing it, what was causing me to be this way, why I couldn’t overcome it, yada, yada, yada. All my thinking made it seem much much bigger than it really was. NOTE: EVERYONE seems to have their own areas of “go-to craziness” that they will focus on incessantly, that they will give meaning and significance to, and which will therefore inform their beliefs about themselves/others/the world, their day to day reality, their behaviours, and their experience of life. One of mine, just happens to be procrastination. 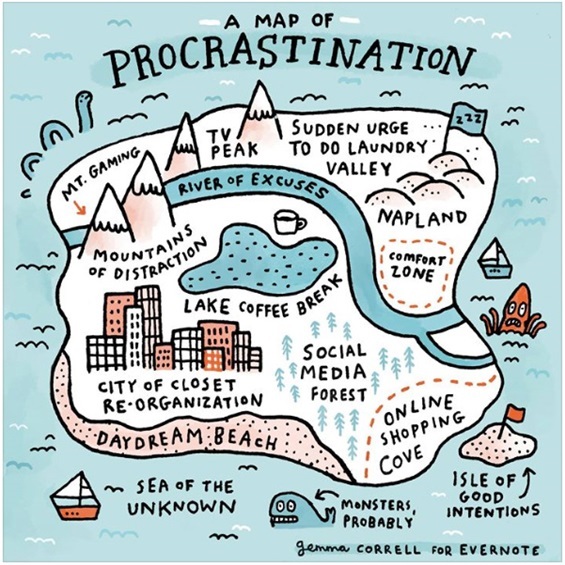 Those who tend to "procrastinate" less, and tend to get things done right away, versus avoiding them or leaving them until later, just have a different set of made up beliefs that inform their behaviours. Some might be so horrified by the idea of being perceived as lazy that the feeling supercedes any thoughts about not getting done or delaying. Some may have the need to constantly get things done to prove some level of worthiness or acceptance by others. Some may exist in "constant control mode", having to ensure all their ducks are always in order and completed and ready in advance, to avoid whatever painful consequences they imagine would befall them if not done. Some can't sit still for a moment, being left alone with their thoughts, and so are driven as a sort of addiction to get a variety of things done, in order to feel better. The beliefs that any person could have to drive their behaviours away from procrastination or to NOT be perceived by themselves or others as a procrastinator, are as infinite and complex as the universe. 1. I noticed and gave significance and meaning to every time I felt I was delaying doing something, and then each time I remembered it, I suffered, feeling the emotional pain of it as well as the physical pain of it… the pit in my stomach, the tenseness in my shoulders, the migraine in my head, etc. 2. I dismissed every time I actually did many thousands of things regularly or without much delay… I gave absolutely no significance to anything that got done because it was easy, fun, effortless, automatic, or anything that I wanted to do or liked to do, or anything I did regularly out of habit. Even things done that seemed challenging or difficult, were still given no significance for being completed. Insight #4: I Compared Myself to "Non-Procrastinators"
I would see others “getting things done” that I wasn’t getting done as further proof that I was broken in some way. I never noticed much of what other people DIDN'T do. I mostly seemed to ONLY notice what they did do. I never noticed or gave any significance to the fluctuations in my thinking. I never saw how my perception of my procrastination sometimes felt much worse, sometimes felt much better, and sometimes didn’t come into my thinking at all. I always seemed to make the connection that it was my procrastinating behaviours that were causing my feelings, not realizing it was just the natural ebb and flow of thought in each moment that was affecting how I felt… in a bad state of mind I felt crappier about everything including procrastination, and in a good state of mind I felt better about everything including procrastination. I NEVER appreciated or gave credit or significance to any of the great benefits of procrastination, including the number of times that I saved myself a ton of work and issues that others experienced because they were so focused on their own made up significance for getting things done and checking things off their list. I never appreciated my unique ability to more effortlessly change from one project to another, or to move from one focus to another, without having much resistance to the change. Without being so tied to getting things done right away, I was often less affected by all the stress that many others would innocently create for themselves from the inherent nature of continuous change in work and life, and their self-created stress from not being able to get many things done as planned. One day it hilariously occurred to me that I was not a professional procrastinator. Instead I was just an incredibly gifted professional at making never-ending lists of things that I didn’t want to do. Still makes me laugh when I think about it now. I never made lists of anything I did automatically, or anything I wanted to do. I just remembered those things and did them. And when I delayed anything I wanted to do or liked to do, I didn't consider it as procrastination. I had another made up reason or I didn't even think about it at all. I've pretty well stopped doing the "list making" thing. I rarely make lists any more, except when my schedule is busier or when I have some specific or complex deadlines that I think might be managed better in some sort of list or reminder system. Otherwise, I find that everything else, for the most part, I eventually remember to do. Amusingly, I have found that since abandoning most of my lists (basically, abandoning a lot of extra thinking), my ratio of forgetting or missing things has somewhat decreased. And the same as before when I made lists, if I forget anything, it's usually no big deal. I simply do what I need to do to fix it, but now I tend to have much less personal judgment about it, and much less residual thinking about it, therefore allowing for much less of my personally rich history of ridiculous self-created undue suffering. 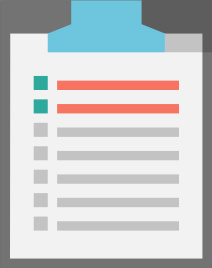 By the way, no longer making lists is just something that works for me, and not something I recommend for anyone else. Every single one of us, using our own personal, crazy, made up thinking, needs to figure out for ourselves what works best for us. But it might be worth a little test, if you are a fellow "list-sufferer" and the idea seems intriguing. I never realized how I had created procrastination into a "thing". Every time I apparently “delayed” doing anything, I attributed it completely and wholly to the mysterious “disease of procrastination”, whose code I could not seem to understand or break. I didn’t see all of the incredibly complex and varied reasons (millions of made up and believed thoughts) for delaying or not doing things. I created my own “diagnosis”, labelling everything delayed or not done as procrastination, and therefore created all my suffering trying to understand and fix a very specific disease that didn’t even exist. No one on this planet can "be" anything, except human. Every other label (whether bad or good) is simply that, just a thought-created label used to describe a temporary behaviour. Any specific behaviour has nothing to do with who and what we are, other than the fact that we are human. Instead, every behaviour is simply an indication of where we are in each temporary, and inevitably changing moment. All behaviour is inherently temporary. In every changing moment as our thoughts inveitably change, our behaviour inevitably changes in some way as well. It is impossible to ever do any one thing all the time, so it can't possibly "be" who we are. Insight #10: I'll Always Be Perfectly Fine, No Matter What! OK... now this insight may be a little less clear. And I give you fair warning that although I'm trying to explain it, I realize that it may not mean anything to anyone unless they've realized something similar, or unless they get some sense of what's behind the words as they read it. When I came across the Three Principles, I had the deeply profound realization that I would always be perfectly fine, no matter what happened, even if I died. I realized that I was not my "crazy made up thinking", nor my behaviours, nor my experience of life, and neither was anyone else. I realized that underneath all my experiences and perceptions of "me", that I was, and was connected to, something completely impersonal and unconditional, and much more significant than any of the small, personal, petty, made up ridiculousness that frequently appeared in my head. I realized I was living in the complete illusion of my personal made up thinking, and everyone else was too, and that there was much more to the truth of life than could be explained, although it could be felt, or realized, or intuited, or glimpsed, or experienced in some way. I realized that I could never be broken, and nor could anyone else. I realized that I was (and everyone else was) experiencing the illusory belief of our separateness, and so was living in a state of continual comparison and therefore, some level of illusion of not being worthy, and of not being enough, and as a consequence, producing all sorts of made up insecure thinking to reflect the same, and to behave in accordance. I realized that if anyone else got a glimpse of what I had seen, they would think and act much less from this insecurity (this separate and personal illusion), and much more from the impersonal, unconditional love that lies just beneath the illusions of other. All of a sudden, everything in life made complete sense. And ultimately, that's the biggest insight that I keep falling back into, and that keeps reminding me that any of my thoughts of "procrastination" are just temporary blinding little flashes of personal distraction, getting in my way of remembering who and what I am underneath all my ridiculous, craziness. And oddly enough, whenever I remember this, I get to relax, I get to just be the perfectly imperfect "me" (whatever that is in the moment), I get to be much kinder and less judgmental of myself and others, and I get to "non-procrastinate" (whatever that means). By the way... the UNIVERSE (God, Universal Intelligence, Great Spirit, whatever you want to call it) is a SERIOUS procrastinator! It rarely provides anyone's insights when we ask for them, nor provides what we want on our preferred identified deadlines! So hey, if the Universe can be such a chronic procrastinator, then I can too! So there! Thank you Ganesh! Thinking can get us into trouble and out of trouble! 😄 It's so nice whenever I remember to take it all a lot less seriously! Jonelle, I love your honesty about all different facets of your life! Your stories are real gems of wisdom and thanks so much for sharing them with us! Thank you Antonia. At first, sharing my personal craziness was scary. But over time as I have seen and accepted my human-ness, it has gotten much easier. Thank you so much Jan! It was very kind of you to let me know. What a beautiful, inspiring journey to the inside-out understanding of the 3P's. Well written and full of humor. Thank you so much Marnix. The site gets visits but I don't always get to "meet" the beings behind the keyboards. It's always so lovely to hear it's appreciated.